One of the most exciting aspects of the newly-released FileMaker 12 product line upgrade is a major redesign to the product’s UI. A new Design Surface modernizes FileMaker Pro layouts and updates every built-in control, giving developers and designers powerful new tools for designing better interfaces. But as great as Design Surface is, why just stay on the surface? Here’s how to take advantage of a hidden key in FileMaker Pro 12 to go far beyond the limits of the default set of layout controls. This article will demonstrate how to incorporate virtually any UI control you see on the web directly into your FileMaker 12 Pro — and FileMaker Go — layouts. Web 2.0 controls and widgets can now be full citizens of FileMaker solutions. They can display FileMaker data as it updates in real time. They can make real-time changes to FileMaker data — natively, without plugins. In short, with FileMaker 12, you can integrate Web 2.0 controls deeply and transparently into your solutions. Two native web controls (a single and a dual range slider), plus several standard FileMaker edit box controls (first and last name fields, as well as live text values,) work together to create a simple interactive layout. Our ability to fully integrate live web controls into layouts uses FileMaker 12’s new “fmp://” protocol. I’ll cover the details later in the article. For now, here’s the bit we care about: Objects within a Web Viewer can use this new protocol to send messages directly to our FileMaker 12 databases. They can directly call FileMaker scripts and pass parameters to them in real time. This means that a Web Viewer in our solution can make a round trip cycle and communicate any changes about its state to our solution, just like built-in layout controls always have done. In effect, this turns Web Viewers from display-only portals into full citizens of our FileMaker world. Anything we could see in FileMaker 11’s Web Viewer can now potentially talk directly to our FileMaker 12 solutions. This technique works well in both FM Pro 12 and FM Go 12, with one quirk. As of this writing, this technique using the fmp:// protocol doesn’t work with standalone FileMaker Pro databases, although it works fine with standalone FileMaker Go databases. (So, you may want to make sure you have a FileMaker Server or an iPad handy). Hopefully, this limitation will be addressed with a future release of FileMaker Pro. There’s certainly nothing wrong with this, especially given the FM 12 Design Surface’s new abilities to provide CSS styling and web-like object hover and focus styling. Still, let’s imagine that we want to provide range sliders on our layouts, just like users would see on the web. 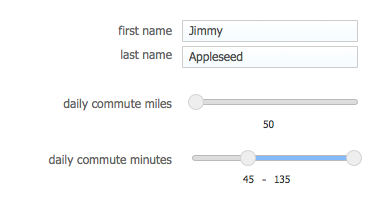 We want a simple slider for daily commute miles, and a dual/range slider for the daily commute fields. On our layout, we’ll add a Web Viewer set to get its data URL from our Custom Function. This is an important first step where we confirm that our web control acts like it should – in this case, sliding back and forth like a slider. But we haven’t yet told our widget how to communicate with our FileMaker solution, so we won’t expect any interactivity yet. At this point, our Web Viewer will be able to see FileMaker data and will immediately respond as we change the linked field data. Now let’s teach our Web Viewer to talk to our solution. To do this, we’ll add two more script parameters to our Custom Function: These will let us pass the name of the FileMaker script we’d like our web control to call when it’s been modified, and the name of the field we’re binding the control to. sQuote ( url.fm ( script ; target_field & "|" ) ) & "
With this in place, our web widget will now look for the FileMaker script we direct it to via our script parameter, and if it’s able to connect, it will pass the live parameters we’ve set up. We’re almost there. And, just like that, we have a live jQuery slider on our layout! It’s attached to our miles field as desired. If we update the FileMaker field data, the slider will update instantly to reflect the change. If we move our slider, our underlying FileMaker field data will immediately update as well. Both objects understand and enforce the same data constraints (minimum, maximum, and even step values). From a user’s perspective, there’s little if any noticeable difference between stock FileMaker layout controls and our new jQuery slider. Everything “just works”…Sweet! With that under our belt, let’s tackle the second part of this job, and add a multi-range slider. This will go quickly now that we understand the basic steps. Once the initial path is paved, Web 2.0 controls and widgets are simple, expressive, and fun to use in FileMaker 12. You’ll certainly want to do some prep and planning when you’re selecting and setting up a new web control. But once you’ve configured a control as a custom function, you’ll be able to simply drop this web control directly into any Filemaker 12 solution. This technique opens a doorway to a world of possibilities previously unavailable to the FileMaker development and design communities. For those of us who’ve long been limited to a handful of possible Ui controls, the ability to simply locate, adapt, and integrate virtually any control we can find on Web 2.0 world can be quite a revelation. We suddenly have the ability to implement sophisticated controls and rich design patterns that have until now been beyond our reach. Exciting stuff! If you have any feedback, questions, or ideas, I look forward to hearing from you. April 23 – Thanks to Bruce Robertson for some very helpful Go-specific feedback. I’ve updated the demo file with an additional example of an html5 slider that’s been visually and functionally optimized for Go implementations. Go adds several interesting challenges to implementing this technique gracefully, and I look forward to further feedback and ideas on this front.